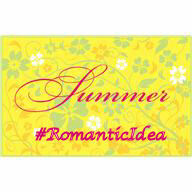 Jacquie has opted for an interview for her #romanticidea offering. Enjoy! Where did you grow up, and how did this influence your writing? I grew up in a small town in west-central Alberta, Canada. I think this influenced my writing in a number of ways. As kids we had to occupy ourselves, there wasn’t the activities that you would find in a city. Our biggest adventures would be going to the pool (an outdoor one, complete with hornets and horseflies J), to going to the theatre on Saturday afternoons. Other than that we ran around with our friends or made up stories in our heads. It was a good life, though. Much easier than the challenges faced by kids today. If you could point to one specific work/author that drew you to writing in this genre, what or who would that be? That’s easy- Suzanne Brockmann. Her Troubleshooter series holds a special place on my keeper shelf. Are you a plotter or a pantser? Pantser, all the way. I’ve taken plotting courses, but had to fight myself to finish them. It’s like pulling teeth for me to try and set everything out by scene. Usually I get an overall idea in my head and then start writing. I never know from one sentence to the next what’s going to happen. Once you’ve got the story idea down, who writes the book? You? Or your characters? I think it’s a combination. I do the setting, narrative parts and the characters take over the dialogue. Is silence golden, or do you need music to write by? What kind? Absolute silence is best. I usually write from about 9-10 at night until midnight or later, once the house has gone quiet. Where do you see yourself in 10 years? Hopefully a NYT bestseller! What are you working on now? What is your next project? I have two stories I’m working on at the moment. One is a Christmas novella that’s promised to a box set and the other is a murder/mystery I’m having fun with. Okay, now spill. Tell us about your newest release. We want to know!!! I’m excited to share this with you today. 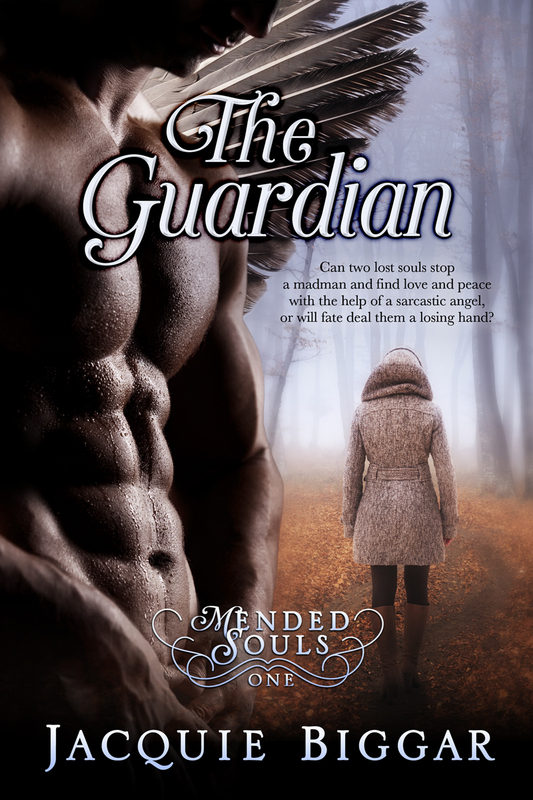 It’s my first paranormal romantic suspense novel titled, The Guardian. As the local ME, Tracy York, investigates the case, discrepancies begin to point to more than a simple drunk driving incident. 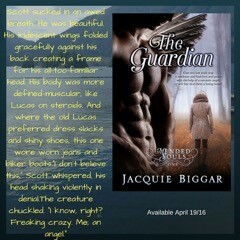 When threats are made to Tracy’s life can Scott and his guardian angel, Lucas, protect her, or will she become another casualty? Hunger gnawed like a ravenous beast at Lucas’ insides. He hadn’t had anything to eat since the morning of the party and it was starting to catch up to him. He wasn’t exactly sure how long he’d been… you know, but going by the low growl in his belly it had to have been a while. It all looked the same, a sea of foaming white in every direction. Already, he missed the bright lights and city noise, the fresh Santa Ana breeze blowing against his face, a warm woman’s body in his arms. But most of all, he missed Scott. His friend would blame himself. Scott had been the mother hen of the three, the peacekeeper. Friends as far back as Lucas could remember, they’d been warriors in kid’s shorts, fighting imaginary dragons and real life demons together. Always, together. He didn’t care so much about himself, but Lucas needed to make sure Scott would pull through okay. There had to be a way. Maybe he could become a guardian angel, or something. Him, an angel. As if that wasn’t the biggest oxymoron of the century. And speaking of angels; he better hurry up or he was going to get left behind. He’d yet to see the face of the robed figure in front of him. The guy wasn’t exactly a chatty Cathy either. He’d tried a couple of times on their seemingly never-ending pilgrimage to get him to say something, but so far, nada. Hopefully they weren’t all like that up here, or he was going to go stir-crazy. “So, you got a name?” he asked, damn near jogging to keep up. Maybe he should ask for wings instead of food. “You have to earn them.” There it was again; the voice that wasn’t a voice. “Quit doing that, man. You’re spooking me out, here.” As though everything else he’d been through in the last while wasn’t enough to raise the old goosebump-o-meter. Just then they topped about their fifth rise and lo and behold, a small wooden building appeared near what almost looked like a Thomas Kinkade lake scene. The closer they got, the better it smelled. Someone was pan-frying fish over a campfire. Lucas’ mouth salivated. The scent took him straight back to happier times, just after he and Scott had left home and were making their way to Hollywood, land of the rich and famous. They had no real cash so they’d chosen to camp out rather than waste their money on hotel rooms. One night the two of them camped by a lake the color of the finest of emeralds. The fishing was great, and they’d feasted on trout and grayling with a bread chaser. Manna from heaven, Scott had said, laughing. He’d been right. Lucas’ stride lengthened, his pulse clamouring to know who was doing the cooking. They rounded the corner of the cabin and there, in front of the dancing flames, sat a wizened old man with a flowing white beard and shoulder length hair. Lucas stumbled to a halt, his heart plummeting with disappointment. “Move, don’t make Him wait,” the omnipresent voice whispered through his mind. Lucas felt like a kid. He wanted nothing more than to run crying and throw himself at the ground and beg his forgiveness. The kindness and gentleness emanating from the man reached out and embraced Lucas in a warm hug, giving him the strength to move forward and greet his Lord. He dropped to his knees and bowed his head in shame. He had no right to be here, in His presence. “You’re right, you don’t,” his cheering squad of one muttered in his ear. “What?” Lucas and the monk voiced their dismay as one. “Don’t get smart.” Monk man again. A vision appeared. Scott and that woman doc from the morgue were running through a dark alley. Shots were fired. Scott was limping. The woman tried to help him, her arm around his waist, but then she went down. The look of anguish on his buddy’s face drove Lucas to his feet. The image evaporated and he was left staring into the fire. He looked up and met his new partner’s gaze. They took each other’s measure, and then the monk nodded. The Lord just smiled, as though he’d known the outcome all along. Jacquie writes Romantic Suspense with tough, alpha males who know what they want, until they’re gob-smacked by heroines who are strong, contemporary women willing to show them that what they really need is love. This entry was posted in Thursday Tea & Company. Bookmark the permalink. 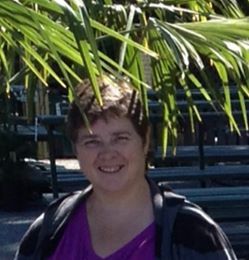 Hi Mari, thanks for hosting me on your lovely blog today!